Almonds are healthy for you, and some roasting with sea-salt can make them more fun and snacky. Further more, they are on sale at the moment! Three pounds (48 ounces) of Amazon’s house brand “Happy Belly” are on sale for $13 at amazon.com, or slightly less if you do one of those “Subscribe and Save” things. On top of that, these are Made in American almonds, from the Central Valley in California! “Happy Belly” products are restricted to Prime members, yet another benefit of signing up for the benefits-loaded service. Cinnamon fans, unite and take over! Amazon is offering their house brand of Happy Belly 1 lb of Organic Ground Cinnamon for $5 with up to four of these per customer at this price. There is a catch however, they are an add-on item, so you must place a $25+ order, elsewise the shopping cart won’t let you buy them. Four of these are $20~, so you just need another small thing to get to $25+. May I recommend the Sencha Mints or the RXbar 12-packs? Clip-on coupons to the rescue! Amazon’s Prime Pantry is currently running a green clip-on coupon promotion on their one pound of , with the coupon dropping the price down to $2.07 or so. Not bad for a pound of this stuff! For more ideas, check our previous Prime Pantry posts. IMPORTANT: Prime Pantry product availability varies by region, so items that are in-stock at one location, may not be in-stock at another. Prime Pantry operates locally, you can only buy what’s available at your local warehouse. This is different from regular Amazon purchases where they ship items from all over the country. 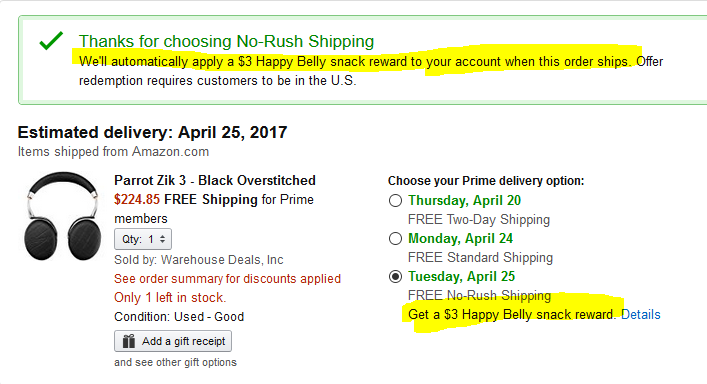 If you are a Prime member, and you make a qualifying purchase at Amazon (it has to be shipped from Amazon’s facilities as a minimum), you may be offered a $3 Happy Belly store credit if you select Slow Shipping instead of the Prime 2-day shipping. The official term for this is “No Rush Shipping” which is more accurate since sometimes things arrive fast anyway (it depends on many factors including availability of product nearby and other orders you may have coming). What is Happy Belly you ask? It is a relatively new line of Amazon house-brand products that, as the goofy name suggests, are food items. These include various nuts, coffee, spices, trail mixes, and …eggs (I’m sure Amazon does not have live chickens in its warehouses). The prices are typically competitive for no-nonsense basic quality products. In typical (frustrating) Amazon fashion, different flavors/options are available in a combination of regular Amazon.com, and/or Prime Pantry and/or Amazon FRESH. YMMV on each item depending on when you check and where you live.